Good afternoon, you galloping love fruit-bats. Here we are again, back with another newsletter! We’ve finalized our roadmap and development milestones for the final stretch of the Early Access process, meaning we’re now barreling towards the endgame. On said roadmap are things like the combat revamp, additional items, content revamp and a host of other goodies we’ll share on stream and in these newsletter in the coming months. The volcano and jungle will become available at launch, whereas the new combat paradigm will roll out on PC before May 8th. Project Content Rebalance will hopefully make it to PC players pre-launch, but may be moved back depending on when the work is finished. The submission and certification process runs through January and February and the Gold Build needs to be locked in and ready for print about 6-8 weeks before full launch. The reason for this is that printing physical discs happens in one location, while packaging the physical editions takes place in a different location. Only certain printing houses are authorized to print console discs, so we have to work around their capacity and lead time requirements. On PC things are more relaxed. There’s more flexibility in terms of where the discs are printed. Once the Gold Build is approved the team will switch focus to the day 1 patch for PC and consoles. The day 1 patch will include less critical fixes as well as some content changes that did not make it into the Gold Build. If you’re interested in reading more about Day 1 Patches there’s a great blog post from Rami Ismail on the topic over on Kotaku. Early Access players on PC will continue to see some patches and updates, albeit somewhat less frequently. For Xbox players it means there won’t be an Update 32 Parity Patch until March at the earliest. Once the submission and certification process begins Microsoft doesn’t allow us to add anything to the current Game Preview version of the game. We apologize for not being able to release this patch sooner, and thank you for your patience. Hey, would you look at that! Two-handed swords! These are scheduled to come out at launch, and players can craft them out of Stone, Iron, Steel, Hardened Steel and Starmetal. Much like the hammers, they’re big and heavy, taking a long time to swing, but also deal a lot of damage once they connect to an opponent. Secondly, sprinting with weapons and tools is back! This was removed a while back, partly in order to deal with lag jousting, where players would use server latency to win combat encounters. The other reason was to highlight the difference between being in and out of combat. Sprinting away from an encounter is the defining factor that differentiates being in, or out, of combat. However, after both taking your feedback into account and seeing that lag jousting is essentially eliminated with the new combat paradigm, we’re making it so you can sprint with weapons and tools again. We fired off a second combat playtest on Friday, with a ton of changes and updates from the previous test (like sprinting with weapons!). There’s still experimentation going on in terms of stamina management, health regeneration and damage numbers, but we’re steadily moving towards a version that we think will be balanced and fun, and once we are at that stage we will deploy to Testlive servers to hear your feedback and suggestions! Vanguard’s main task at the moment is getting builds ready for certification, making sure they meet all the necessary requirements set by Microsoft and Sony. Pretty much everything from stability, branding, GUI consistency and responsiveness have certain requirements that we need to hit. This is to ensure that the experience on Xbox and PlayStation is more consistent across all games on those platforms. On PC it’s usually more up to each individual developer. In addition to this one of our Vanguard designers has finished up work on the new perk system, which will add improvements and modifiers to your character based on how you’ve levelled up your Attributes. Examples include things like a double jump skill, better stamina consumption, quicker healing, and now, a ricochet shot, for all you Hanzo mains out there. They’ve also shown the system for dying and respawning some needed love in order to improve the experience for players. Player corpses should now reload more consistently after a server crash. Death Markers should also be less prone to breaking. NPC and player corpses now have different expiry times, and they’ve added a neat little glowing green light that emanates from your character’s bracelet when they die. Last, but certainly not least, is a quick loot GUI to help you take things from players and NPCs much quicker than before. The Terraformers have been wrapping up the final bits of content they need to get wrapped up for the Gold Build. We’ve talked extensively about the volcano and jungle already, so we’ll leave those out for a bit this time and talk about some other stuff! Project Content Rebalance has been going well so far and we got to experience a sample of the changes during the Friday combat playtest. This rebalance involves tweaking the NPC population and resource nodes in order to provide a more diverse and challenging experience to players. Being used to the previous “shotgun approach” to NPCs and resources the game definitely felt different, but in a positive way. Creatures and NPCs were sparser, which made meeting other humans feel more special, like the Exiled Lands really were a place only the strongest can survive. In terms of new content there’s a lot in the pipeline that’s coming in for launch. We’ve mentioned skinning daggers before, and there are 5-6 of them of different materials, planned for the Gold Build. New bows, swords, axes, maces, spears, armors, arrows, resources, crafting materials, deities, trophies, and some secret things are all scheduled to come out in the final, launch build of the game. We’re back on the bi-weekly stream train over on our Twitch channel. If you missed it on Friday, you can find the VOD of our latest stream on YouTube. Friday’s stream was very silly, and a little chaotic at times, but we definitely had fun with it. We plan to do more community focused streams in the future, spotlighting mods, doing a cool building project, Q&A’s and more. And that should be it for this week! 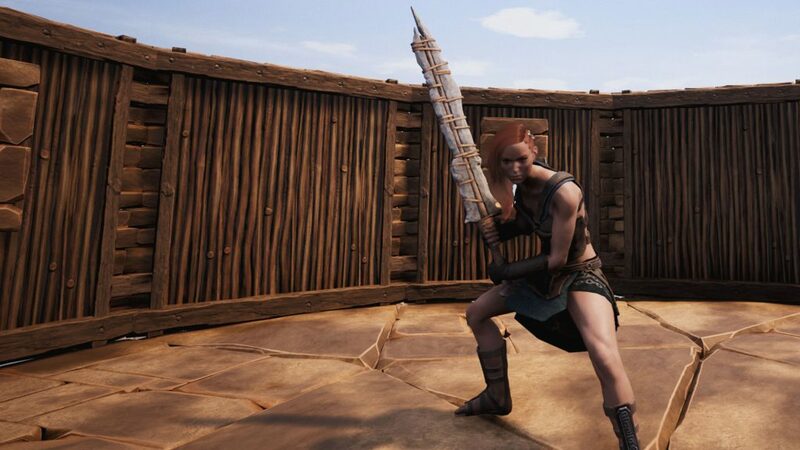 Thank you so very much for reading, for continuing to support Conan Exiles and being a part of this amazing community.